is pure supply chain ‘thought leadership’, with content years ahead of its time. The testimonials from reviewers confirm that. “Anyone who has led a company and/or worked in what we traditionally call the ‘Supply Chain’ function knows that human behavior is at the core of making things work. In his thinking John brings in some of the most poignant observations on how culture and behavior affect supply chain efficiencies. When you hear of the challenges in IT system implementations in the supply chain, they generally lead you to people, structures and of course leadership. The Dynamic Supply Chains framework is detailed and implementation focused, but will take you time to fully understand and digest. To start understanding our world, firstly it is really important to be alive to the fact that we deal with multiple supply chains within our organizations, even with a ‘seemingly’ homogenous customer base. The second is that systems must be designed and people must be aligned to deliver to these differing pulls from our customers. The good news is that there are 5 dominant types of such customers that we need to deal with, which John goes into great detail to describe and investigate. Kevin Brown, Chief Supply Chain Officer, Dell Inc.
“In a world of pundits and talking heads, John Gattorna is the real deal. He’s the voice and the vision that CEOs are listening to and thinking about to get ahead of the competition. Many leading organizations around the world have started to realize that truly understanding the nature of demand is the key to designing resilient and robust supply chains. What they don’t understand is that John has spent decades fleshing out the implications for technology, strategy, and even organizational design. Dynamic Supply Chains lays out these strategies like a blueprint for enterprise excellence. Save yourself millions on consulting strategy and read this book. 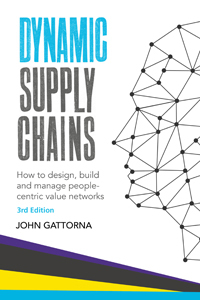 John Gattorna is unique among thought leaders in the supply chain space. In this 3rd edition of Dynamic Supply Chains, John continues to define and refine his insight and wisdom regarding how to design supply chains and organizations around the concept of segmented demand signals. This would be important theoretical work, but John bases his framework and design imperatives on actual case studies and real companies. He has numerous examples collected from senior executives and CEOs. John Gattorna’s work bridges and synthesizes the theoretical and practical, making this book an invaluable resource. Donald A. Hicks, Founder, President & CEO, LLamasoft, Inc.
“John has cracked the code in the same way that Billy Beane of the Oakland A´s and Paul Azinger in the 2008 Ryder Cup did in their fields. But here he has done it for a customer-centric supply Chain.He puts the customer at the heart of everything, and then builds the supply chain around customer behaviours, with a number of different solutions based on this behaviour that runs through the whole supply chain from the customer, through the Sales Organisation, Manufacturing, back to the Suppliers. But the trick is not the alignment of this behaviour, but how the organization builds multi-functional teams aligned to these behaviours, by focusing on organisation design, the people that fit into these chains, and aligning individuals’ natural behaviours with the behaviour of the supply chain. And then be able to dynamically re-adjust and re-configure. The book contains some fantastic examples, from the lowest cost, most basic, but highly efficient and effective supply chains of the Dhabawallahs of Mumbai, through to the most expensive example of Formula 1, via the most sophisticated supply chain that is Inditex, with its global Zara brand. We have here the most complete set of analysis and solutions for today´s business ecosystem, that must adapt to its customers and be constantly adapting to meet changing needs. It offers a complete set of tools to analyse our supply chains and develop solutions to gain a competitive advantage.